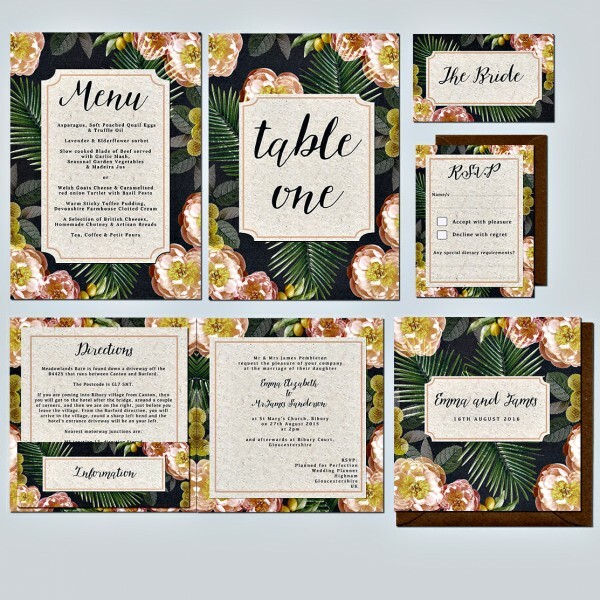 If you’re of the opinion that wedding invitations are a bit too drab and formal for your liking, the Citrus Palm wedding invitation from Lucy Ledger Ltd will be ideal for your needs. As the name suggests, this is a zesty, tangy and uplifting wedding invitation which will play well in the summer months, or even for a wedding taking place abroad. However, the most important aspect of this invitation is the fact that it captures an uplifting, bright and energetic feeling, which is the ideal sort of invitation for couples looking forward to a ceremony, a party and then a life that bounds along with energy and vitality. The stunning citrus colour palette allows the foliage, palms and flowers make for an eye-catching invitation that will take pride of place in people’s homes. There is clearly a functional element to the invitation but this is a fashionable invitation that can hold its own amongst many pieces. This style is replicated across a full range of stationery items so any couple that is looking to correspond in a range of ways will find that this wedding invitation allows consistency. The use of a stark charcoal backdrop and stylish calligraphy ties this invitation together in a manner that demands attention, and this could be the sort of wedding invitation that sets the tone for a stylish, fun and uplifting day. The invitation can be fully customised to provide as much or as little information as you need and there is also an opportunity to utilise the design for many of your place-holders or notices on the big day itself. This isn’t a wedding invitation for every couple but for those that want to create an invigorating sense around their big day, it is perfect.